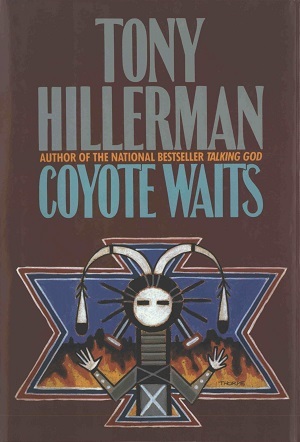 This is the specially illustrated first edition of Coyote Waits, which is Tony Hillerman's tenth Navajo Mystery novel. This edition was published in 1990 by Harper and Row Publisher's Inc. in New York City, New York. The cover illustration is by Peter Thorpe, who designed a majority of the American covers, and depicts a Yeii figure with a fire blazing inside a geometric pattern in the background. This edition is special because there are two color illustrations. The first image is the page before the title page and features the image of an old man walking through the rain holding a bottle of liquor with a hand gun tucked into the waistband of his jeans.The second image is on the half title page and is a full color image of a coyote trotting through grass. Binding: Orange boards with deep purple cloth spines and a southwestern styles geometric design embossed on the front board. The spine features the author, title, and publisher printed vertically on the spine in gold.